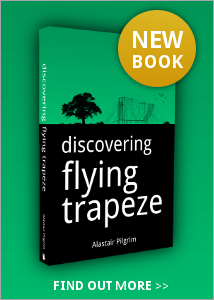 The Trapeze Net - Investigation 2 - How can you change your swing? Investigation 2 - How can you change your swing? In this expression, 2 and g are obviously constants, so the only thing we can change to change the speed (v) is h. In other words the distance moved vertically. This can be achieved by having the flyer start from a greater height, therefore when they reach the bottom of their swing, they will have moved a greater distance vertically, and will have a greater speed. This extra height can be achieved either by jumping higher from the board or using a 'riser' which adds 30cm to height of board. This is quite a considerable change (an increase of about 10%). Adding only a small extra height therefore makes a reasonably large difference to the maximum speed. Does this make swing time shorter? The only factor that therefore affects the time period of the swing is l, the length of the trapeze cables. Providing this stays the same, then you cannot do anything to make the time for one swing slower. It is interesting to note that, as far as the trapeze is concerned, it does not matter if you are very light, or very heavy. As long as you start from the same height, your maximum speed will be the same (v2 = 2gh - independent of mass), and the time for one swing will be the same. This is as long as air resistance is ignored (in reality fat people will experience more air resistance than skinny people and so will swing slower). If you are very tall however, your centre of mass will be further away from the bar than for a shorter person. Using our simplified model of a mass on a string, the string will have to be longer, and therefore l increases. If you increase l, you increase the time period of the swing. It is important to note that all these observations are correct in ‘a perfect world’ where all our assumptions are true. As any catcher knows, different flyers have different swing times, and therefore different catch timings, which seems to go against the principles we have just discussed. There are many factors (air resistance, body movement) which come into play in real life and which have to be taken into account. If we tried to include them all here, the maths would become impossible. Let us compare the period of a 6'6" (2m) man with a 5'10" (1.8m) man. We know that, from our original model, a 1.8m man has a swing period of 4.3s. A 2m man is 0.2m taller, therefore his centre of gravity is 10cm further away. This is such a small difference it would not be noticeable. Therefore the size of the performer makes very little difference. Maximum speed is not very important when it comes to performing tricks. What is important is the height you reach at the other end, and the time you spend above a certain height. If you have a low swing, you will find it difficult to reach the catcher, making a catch very difficult. However, if you have a high swing, you will easily reach the height required for a catch.